A scene of storm damage from Elmhurst, Pennsylvania in Lackawanna County. 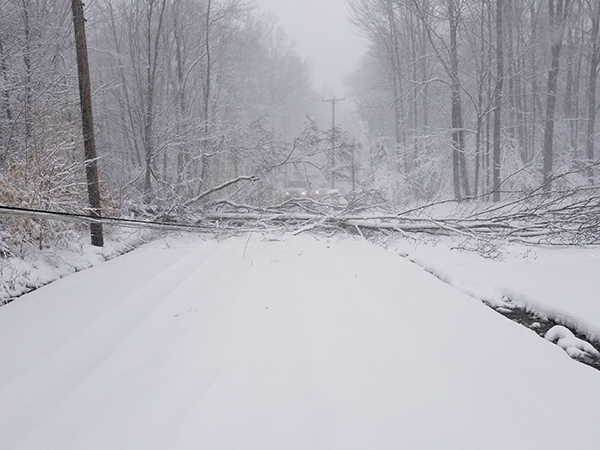 ALLENTOWN, Pa. (March 2, 2018) — A rapidly-intensifying storm packing rain, snow and high winds is causing power outages across the PPL Electric Utilities’ service area with about 1,500 repair jobs identified by late afternoon. The number of outages is expected to continue to grow as wind gusts cause additional damage. The utility’s repair efforts could last through the weekend. As of 3:30 p.m. Friday (3/2), about 100,000 customers were out of power. Make sure cell phones and other personal devices are fully charged. Use generators safely. If you have to run a generator, make sure you run it outdoors in well-ventilated area — never indoors or in a garage.